Many nations have embarked on the mission to clean the world and to achieve economic growth that is environmentally sustainable. Businesses have increased the use of green energy and have started to promote environment-friendly policies. The recent surge in oil prices has increased the number of alternative energy production initiatives, which are increasingly receiving support from a number of governments around the world. The quest to clean the world and to achieve sustainable growth has found supporters among many investors. Some investors have come to view these positive trends as opportunities to capitalize on growth in new technologies. General Electric (NYSE:GE) is one of the world’s largest producers of wind turbines. Since entering the renewable energy market in 2002, GE has invested more than $850 million in renewable energy technology. Its Ecomagination program focuses on development of compact fluorescent lighting, fuel cells, smart appliances, wind turbines, hybrid-powered water heaters, and lower-emission GEnx aircraft engines. GE has also been active in solar power, operating in a joint venture with e-Solar, and gas engine manufacturing through its subsidiary GE Jenbacher. Each year, the company produces enough green energy from its wind turbines to power the equivalent of New York City. The company has a total market capitalization of $207 billion. 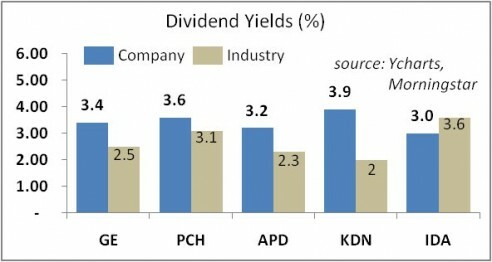 It pays a dividend yielding 3.4% on a payout ratio of 56%. GE’s peers Philips Electronics NV (PHG) and Siemens AG (SI) pay dividend yields of 4.1% and 3.4%, respectively. Vestas Wind Systems (VWDRY) does not pay dividends. GE has forward P/E of 12.5, on par with its diversified industrials industry. The stock is trading at $19.6 per share, up 6.4% over the past year. The stock is popular with billionaires Ken Fisher and Warren Buffett. Potlatch Corporation (NASDAQ:PCH) is a REIT that controls some 1.44 million acres of timberlands in Arkansas, Idaho, and Minnesota. The REIT derives its income from investments in real estate and the sale of standing timber through a real estate sales and development business and five wood products manufacturing facilities that produce lumber and plywood. Potlatch Corporation is enforcing sound environmental stewardship, managing its timberlands with the objective to increase their long-term sustainable yield. The REIT has a total market cap of $1.4 billion. It pays a dividend yield of 3.6% on a payout ratio of 132% of earnings and 78% of funds from operations. Its peer Plum Creek Timber Co. Inc. (PCL) pays a dividend yield of 4.1%, while Louisiana-Pacific Corp. (LPX) does not pay any dividends. The stock is pricey, as it is trading on a forward P/E that is well above that for the industry. The shares are changing hands at $34.9 a share, down 1% from the year earlier. Billionaires Cliff Asness and Jim Simons are investors in the company. Air Products & Chemicals Inc. (NYSE:APD) is one of the largest global bulk gas sellers. It sells atmospheric and specialty gases, including hydrogen, helium, nitrogen, and oxygen. The company’s main customers are industrial manufacturers and commercial end-users of industrial gases. Inter alia, with more than 50 years of hydrogen experience, the company offers fully integrated hydrogen fueling stations. Its first hydrogen fueling station was deployed in 1993. The company has a total market cap of $16.8 billion. It pays a dividend yielding 3.2% on a payout ratio of 46%. Peers Airgas, Inc. (ARG) and Praxair Inc. (PX) pay dividend yields of 1.9% and 2.0%, respectively. 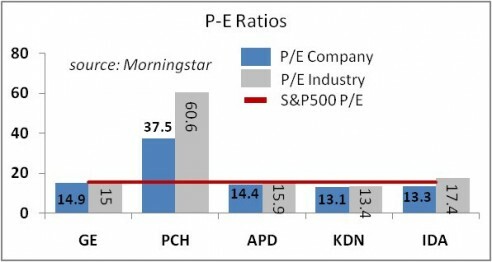 The stock is trading on a forward P/E above that of its industry. The shares are changing hands at $79.60 a share, down nearly 16% over the past 12 months. Fund managers Edgar Wachenheim (Greenhaven Associates—check out its holdings) and Ric Dillon (Diamond Hill Capital—see its top picks) are bullish about the stock. Kaydon Corporation (NYSE:KDN) makes friction control bearings and filtration products for a number of industries, including power generation and refining. The company is one of the world’s leading producers of wind turbine bearings. With a market cap of $653 million, the company pays a dividend yielding 3.9% on a payout ratio of 52%. Its rivals Timken Co. (TKR), Kennametal Inc. (KMT), and Kaman Corporation (KAMN) boast dividend yields of 1.9%, 1.7%, and 2.2%, respectively. The stock is trading on a forward P/E that is below the industrial machinery industry. The shares are trading at $20.33 a share, down more than 45% over the past year. The stock is popular with Chuck Royce (Royce & Associates—see its holdings) and Ric Dillon. IdaCorp Inc. (NYSE:IDA) is a diversified holding company with subsidiaries serving as electric utilities with the majority of generation based on hydroelectric power. A subsidiary Idaho Power owns 17 hydroelectric power facilities while subsidiary Ida-West Energy owns nine generation facilities. One of the company’s holding entities is IDACORP Financial, a holder of affordable housing projects and other real estate investments. The company’s market cap is $2.2 billion. Its dividend yields 3.0% on a payout ratio of 40%. Competitors Portland General Electric Company (POR) and Avista Corp. (AVA) pay dividend yields of 4.0% and 4.2%, respectively. The stock is trading on a forward P/E that is above that for the conventional electricity industry. The shares are changing hands at $43.05 a share, up 8% over the past year. Fund manager Jean-Marie Eveillard (First Eagle Investment Management—see its top picks) and value investor David Dreman are bullish about the stock.